If you think you know Medea, you probably have yet to see Mojada: A Medea in Los Angeles. 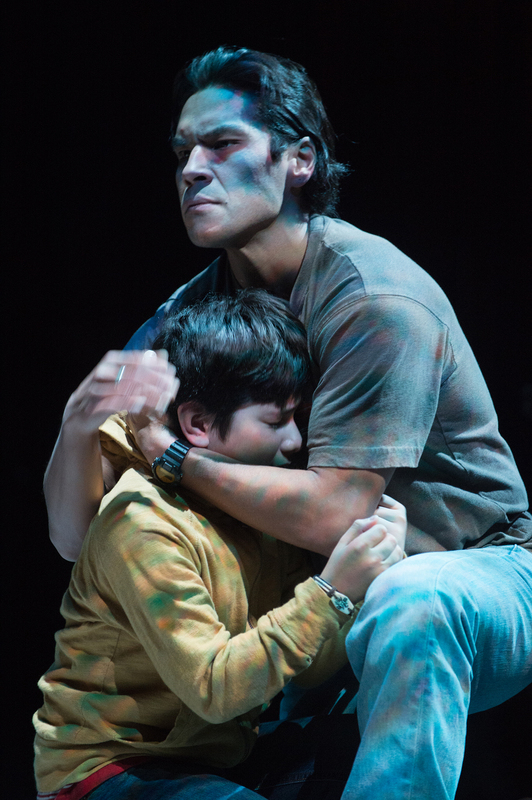 The play, written by Luis Alfaro, turns the Greek tragedy into an immigration story, and in doing so reimagines the title character as someone much more sympathetic than the Medea of Euripedes’ play, which was first produced in 431 B.C. This is Portland Center Stage’s 30th season, as Artistic Director Chris Coleman points out in the playbill, so it seems fitting that this production of Mojada from the Oregon Shakespeare Festival would be part of the season. PCS, after all, originally was a Portland extension of Ashland’s OSF. 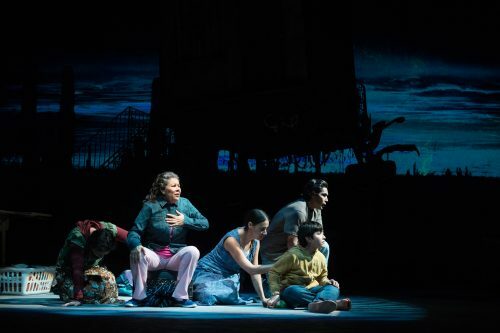 “Mojada” – which translates literally to “wet” in Spanish but is used in the play as a racial slur to describe immigrant Medea from Michoacán, Mexico – is about an illegal immigrant family in Los Angeles with a secret (many, in fact). Medea’s husband, Jason (Lakin Valdez) – think Jason of the Argonauts in Greek mythology and the Euripides tragedy, but here pronounced “ha-SONE” – is the ruthless social climber who wanted to leave Mexico in the first place. He brought along his wife, Medea (Sabina Zuniga Varela), who uses her magical hands to sew collars for Bloomingdale’s at $8 a pop (Bloomingdale’s turns around and sells them for $120 each, of course); their young son, Acan (Jahnangel Jimenez); and Medea’s longtime mother figure/housekeeper, Tita (VIVIS). In Los Angeles, Jason works nearly constantly for his “lady boss,” Armida (Vilma Silva), who wants more from him than an employee should have to provide. Meanwhile, Medea has become a fearful recluse, never leaving the house. Tita brings home a friend, Josefina (Nancy Rodriguez), who becomes a sister to Medea and provides hope that they can have a good life here. Alas, it is not to be. I won’t spoil the ending – though if you know the Medea story, you will likely expect what’s coming. But Alfaro’s play, along with the nimble, fast-paced direction of Juliette Carrillo, and especially Zuniga Varela’s performance in the title role, make this Medea more complicated, sympathetic, and real than any figure of Greek tragedy can hope to be. One of the benefits of moving a fully imagined production from one theater company to another is that it arrives in near-perfect form. And that’s the case for this production of Mojada. Christopher Acebo’s set and costume design couldn’t be any better – and both set and costume play crucial roles here, so that really matters. The set is haunting: You’ll find yourself thinking about Medea and Jason’s home long after you leave the Gerding Theater at the Armory. And, since Medea is a seamstress (and magic), the clothing is both beautiful and magical. Under Carillo’s tight direction the play moves at breakneck speed, especially toward the end. Carrillo doesn’t dwell on difficult or emotional moments longer than absolutely necessary. 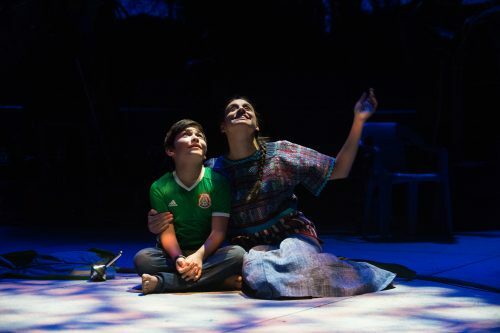 The actors completely embody these roles, having played them for ten months of the past year already (and, in the cases of VIVIS and Sabina Zuniga Varela, even longer from previous productions of the play). Valdez somehow makes you loathe and love Jason at once – the better to understand Medea’s own struggle. 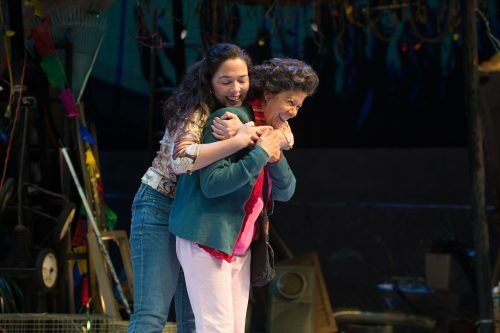 VIVIS is a show-stealer as Tita: a small stage presence that you might not expect much of, but both actor and character are pivotal and in nearly every scene. Eleven-year-old Jimenez is as good a child actor as I have seen. Rodriguez is a delightfully goofy and oblivious friend who says the things no one else will. But this is Zuniga Varela’s show, and boy, does she deliver. Her character is quiet, afraid, reserved, and meek, so it would be easy for her to be overshadowed by powerhouse actors like VIVIS, Valdez, and Silva. But her quiet grace, her stoicism, the quick flashback scenes between scenes, bring a larger-than-life character to the stage. Zuniga Varela portrays true desperation in Medea during the run-up to the play’s final moment. And, without giving too much away, her performance in that final moment could have been a caricature in the hands of a lesser performer. Instead, it devastates and shatters expectations. This production is incredibly powerful, and one could almost call it feminist in the way it paints Medea much more sympathetically and with greater understanding. Almost, except for one thing: It’s tough to swallow, in 2017, a female villain the likes of Jason’s boss, Armida. One can certainly argue that Jason’s betrayal makes him the villain – and I wouldn’t disagree, as his behavior is what ultimately leads to tragedy – but Armida is painted as the most recognizably evil. Perhaps it’s because the play is as complicated as the character of Medea, and will not be easily boxed in. In fact, it’s sprawling, and larger than life. Portland Center Stage’s Mojada: A Medea in Los Angeles , a co-production with the Oregon Shakespeare Festival, continues through Nov. 26 on the Main Stage at The Armory. Ticket and schedule information here.